An Indonesian military transport plane leaving an air-force base in Medan crashed two minutes after taking off on Tuesday. The plane — which had been trucking along since 1964 — crashed into a building that housed a spa, stores, and homes in Indonesia’s third largest city. The plane was engulfed in flames and black smoke; when the crash happened, the building basically combusted. At least 50 bodies have already been recovered — it was not clear whether any of the casualties counted so far were on the ground at the time of the crash. A military official told a local news station, “For the moment we know there were 113 people (on board). It looks like there are no survivors.” The air force is currently trying to figure out whether anyone got off the plane at the air-force base in Medan; the plane stopped there after leaving from Jakarta. The plane was carrying many women who were relatives of military personnel. 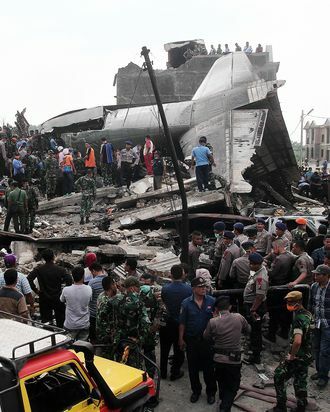 Indonesia’s air force and commercial flights have had notorious safety issues. The European Union briefly banned Indonesian airlines from Europe’s airports between 2007 and 2009 because of these concerns, according to the New York Times. The most recent crash happened in December, when a plane carrying 162 passengers descended into the Java Sea.